CMA Chairperson, Cheryl Winn said, the contribution of John Cameron-Dow to the heritage of the Comrades Marathon is something we will always be grateful for. His participation in The Ultimate Human Race and his subsequent documenting of the history of the world’s greatest ultra-marathon from 1921 till 2010, encapsulates not only a meticulous record of facts, figures and records, but also captures the spirit of the event, its humanity, significance to South Africa and its power to transform lives. John also authored a history of the Two Oceans Marathon. The running fraternity and everyone who knew John will miss him greatly. Jetline Action Photo’s Johanna Ginsberg said, this is indeed very sad news. Condolences to all of his family, friends and associates. He will be missed. 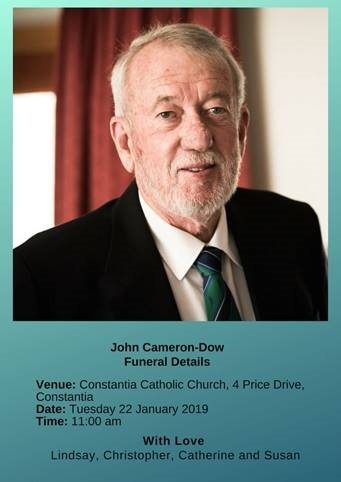 CMA Prize Giving Convenor, Morgan Pillay said, It is with great sadness that I learnt of the passing away of John. My heartfelt condolences go out to his family, friends and all who knew him. He will be fondly missed and remembered.